Revival School Aotearoa, New Zealand is based at, and run by, Fiordland New Life Church in Te Anau, New Zealand. We offer a range of mission trips, training events and internship programs. We are based in Te Anau but run training events and mission trips all over New Zealand and the nations. All our mission trips, training events and internship programs are designed to raise up burning hearted, Jesus loving, catalysts and stewards of revival in our nation and beyond. (A pic taken at Milford Sound when students visited) Te Anau is located on the edge of Fiordland National Park the home of Milford Sound, New Zealand's most famous tourist attraction and one of the most spectacular destinations in the world. A boat cruise in Milford Sound is included in the intensive training schedule. Our Image of God is our most powerful belief. Who we believe God is determines how we interpret the Bible and how we apply what we believe. We believe that God is Love and that God is Good. We believe that God is a Trinity: Father, Son and Spirit. We believe that the Trinity is in perfectly united in Love and that the loving fellowship of the Trinity is the Heartbeat of Heaven. We interpret the Bible and apply its teachings through the lens that God is Love and God is good. The source of our values is our image of God. We believe that God is Love, God is Good and God is a Trinity perfectly united in Love. As a result our core value is Love. We regularly ask ourselves and train others to ask this question in every context: What does Love look like? Whatever Love looks like, that's what we value. One of our highest specific core values is building divine family that reflects the loving fellowship experienced by the Trinity. Our culture reflects our values. We are very intentional about building a culture that catches the Heartbeat of Heaven. There is a Maori word that catches the essence of this divine culture. It is whanau-nga-tanga. The word whanau means family, the word whanau-nga-tanga carries a concept of powerful community, relationship and connection that catches the essence of the fellowship of the Trinity – divine family. We are building a culture of whanaungatanga using these essential building blocks. Unconditional Acceptance: Unconditional Acceptance is an invitation to covenant relationship that is never withdrawn. Unconditional Acceptance is not unconditional intimacy. Intimacy is only experienced in the context of a covenant relationship. Covenant Relationship: A covenant relationship gives people the opportunity to choose if they want to be part of a community. In a covenant relationship the values are clearly defined. Boundaries are put in place to protect those values in order to create a safe environment where people feel safe enough to be vulnerable. Without vulnerability we can never experience intimacy. Vulnerability produces intimacy, intimacy creates connection and connection produces a strong sense of belonging. An Environment In Which We Can Thrive: In this environment of whanaungatanga, people are positioned to come alive and excel above and beyond what they ever believed possible. This exceptional growth environment is one of the great strengths of Revival School and is a major contributing factor to the accelerated transformations that our students experience. Our vision is to raise up catalysts and stewards of a national revival in Aotearoa, New Zealand that overflows to every nation. We are fully invested in raising up burning hearted, Jesus loving Revivalists who live in the fullness of the Intimacy, Identity and Destiny available in Jesus Christ through the finished work of the Cross. Experiencing the unconditional love and delight of the Father changes us forever. As we discover who the Father really is, and how He loves us, we begin to discover our true identity and the bliss of our Sonship. (We use the term Sonship and Son in a generic sense, just as men are the Bride of Christ, ladies are the Sons of God). Our core value of revealing the unconditional love and delight of the Father permeates all that we do. During every mission trip, training event or internship program we intentionally reveal the Father in order to raise up Sons who are securely established in their identity and in intimacy. Strong foundations of intimacy and identity produce a natural overflow of powerful Kingdom Advance. That is because the Kingdom of Heaven is advanced through divine Love. Sonship looks like perfectly receiving and giving perfect expression to divine Love. The more we mature in our identity as Sons, the more capacity we have to establish Heaven on Earth. At Revival School this is our specialty: Revealing the Father, Raising up Sons, Advancing the Kingdom. A Revival School Intensive Training School is ideal training for anyone who wants a radical acceleration in their capacity to Reveal the Father, Raise up Sons and Advance the Kingdom. If you are passionate about getting equipped to establish Heaven on Earth then a Revival School Intensive Training School is for you! At our Intensive Training Schools we host some of the most exceptional ministries in New Zealand (and, we believe, in the world) to train, activate, impart and minister to our students. Our guest speakers are specialists in their fields of ministry so students get training at a world-class level. Revival School Intensive Training Schools are designed to be an adrenalin hit of Kingdom DNA that produce radical transformation and acceleration in peoples lives. During this time students can expect powerful teaching, revelation, impartation and ministry from the Revival School Staff Team and guest speakers. 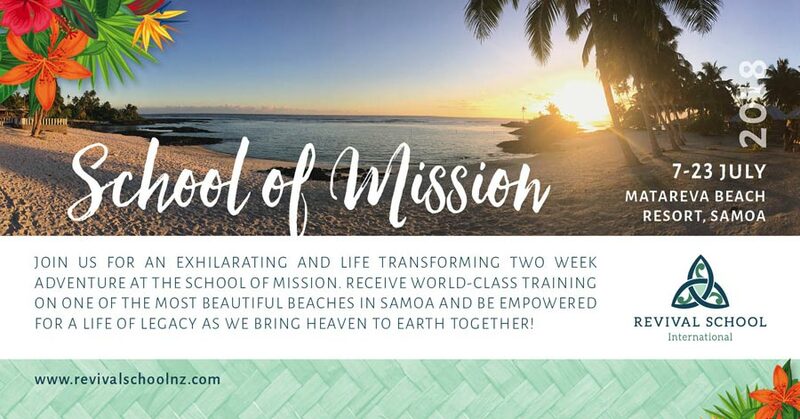 We are excited to be launching the School of Mission in Samoa! We are dreaming of a mass mobilisation of revivalists to the nations who will bring Heaven to the darkest places on the Earth. Our strategy is to build a family of people passionate about going to the nations and bringing Heaven to Earth.